I admit it: I can be awful at taking time for myself. I think many of us are that way, right? Life is just so busy, and we are constantly giving ourselves to others, that we just forget or think about taking time to enjoy ourselves like we should. Here's one example: I wake up early, get started on my blog stuff, and then I'm off to work. I go from one activity to another, and it doesn't stop there. I'm a nanny and am usually chasing after two little ones. Since my day is very occupied, it'll be almost lunch and I'll realize I've forgotten breakfast. Or it will be later in the day and I'll find myself tired, reaching for a less-healthy snack alternative. It leaves me unable to be the person I want to be or be as great as I know I can be. But I've decided to change all of that. I've made a conscious effort to try and add more "sweet" to my life. These are just little things that are making a huge difference. Here are just a couple of things: I'm using a timer to remind myself to get off of the computer and stretch. I've started making spinach smoothies--think spinach, Greek yogurt, a little ice, or maybe some protein powder. The iron in the spinach has really helped my low-energy levels, and I love choosing something that's healthier for me. I'll mix it up and add different fruits, but what I love is to add more greens, like kale, romaine, and celery. And I finish it off by sprinkling a packet of Born Sweet™ Zing™ Zero Calorie Stevia Sweetener. I love this stuff! It’s perfect for mixing into coffee, tea, and other favorite drinks. It's made with only real ingredients-- nothing artificial, with the sweetness extracted from Mother Nature’s stevia plant! In fact, 1 packet equals the sweetness in 2 teaspoons of sugar. It turns my spinach smoothies into a delicious sweetening experience. By making these little changes, like my spinach smoothie, I can be assured that my personal “sweet” bliss isn’t pushed to the back burner by a busy schedule. And now I want YOU to try some for yourself! And now you have a chance to add a little more sweetness to your day with a giveaway for a $100 Visa gift card! To enter for a chance to win, leave a comment below letting me know which one of your favorite beverages are you most excited to mix Zing™ Zero Calorie Stevia Sweetener into first? Mmm I would mix it with my fruit tea! Yum! I will have to try these. I usually do not use artificial sweeteners, but this sounds like a healthy option. Good for you for making healthy changes! I bet it would be delicious in my morning tea! I love my smoothies! I usually use honey but this sounds like a good option too. never heard of this before. going to have to check it out. I typically use Sugar in the Raw because I prefer the real thing....but, this sounds pretty natural! My favorite smoothies are peach, kale, with Greek yogurt. Or I love watermelon and spinach with Greek yogurt. I freeze my fruit first, that way I don't have to add ice. The sound of ice being crushed is horrendous to me. (; I think adding a little Stevia would be the perfect addition to my yummy smoothies. I definitely need this product in my life.. Everyone is so busy now a days I agree!! Ooh, this sounds lovely! I think I would top my grapefruit with it! Stevia is my BFF!! I have never tried this brand before though! I'll have to check it out! Gotta love green smoothies - they have such great benefits! I've never heard of this sweetener, so I'll be on the lookout for it! Sounds perfect, such fans of Stevia. We'll have to look more into this brand! Whoops I got my link wrong in my other comment so I deleted it. But anyway I was thinking about putting this in my tea but I went on the website and now I'm thinking smoothies and muffins too! I would add this healthy sweetener to my Breakfast Strawberry Banana Smoothie! 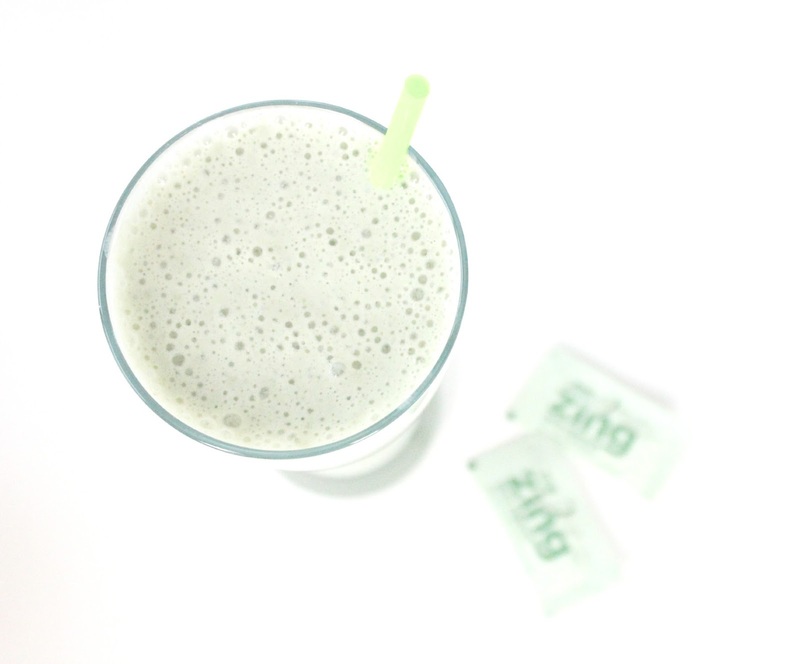 I'd love to use ZING in my daily shakes. Thanks for introducing me to this brand. I've never tried stevia stuff before! It's awesome to make little changes in life that make us feel better! Bananas go reall great in green smoothies! Would add this to just about anything to replace sugar. this isn't an entry because i don't use sugar or alternatives (i know, i know, i'm weird) but i'm just so glad you're taking time for yourself, just reading your blog i know you're a selfless busy bee, so you deserve it!! i never thought to add celery to my smoothies, gonna try that! I am so leary of artificial sweetners... Stevia in the raw is the only thing I'll use so this brand is new to me. I typically use Stevia in the raw so this is a good alternative. Glad you are taking some time to take care of you! Smoothies are the best, great way to sweeten without adding calories. I've never heard of this product, but I definitely have to check it out. Wonderful post. I love your computer timer idea and I really need to get on the smoothie train too. And I'd love to make some for Jona as well. That's what I'd add the sweetener to, a smoothie! I'm a huge fan of stevia, but I've never tried this one. Sounds great though. So hard to make time for ourselves, but it's so important!! I try to make smoothies for myself, just to ensure I'm getting some vegetables and fruits I might not be because I'm horrible about skipping meals! I'd use Zing in my green juices to take the bitterness out!! This product is new to me. I usually use raw coconut sugar but I'd love to try this in daily matcha lattes. I love that the spinach is helping you have more energy, I will have to try that! I would mix it in my peach tea. Seriously fizzy water is my go to and that would be what I would mix it with! Also peach tea is a second runner up :). Still praying for you and thinking of you and yours. OK, that zing sounds so healthy and great. I would like to use Zing instead of sugar when baking. I would like to try it in a cafe mocha. I used to forget to eat breakfast all the time! I've gotten better about it, but I still forget sometimes. I would love to add this into my morning coffee! I enjoy green smoothies weekly so I would try this in them! I'd try Zing™ Zero Calorie Stevia Sweetener in my coffee, and also in homemade lemonade. I'd love try Zing Zero Calorie Stevia Sweetener in my morning coffee. I would love to mix it with my delicious tea! I'm most excited to mix Zing™ Zero Calorie Stevia Sweetener into kale smoothie first. I am excited to try it in my morning cup of coffee! Thanks for the chance to win. Great giveaway! I would mix it into a berry smoothie. I'm most excited to try it in my tea. For me I would like this in plain seltzer or perhaps lemon water. I would so like to try it in my Iced Tea. I'd love to try this in my morning cup of coffee! I'd like to add the Zing Zero Calorie Stevia Sweetener to my iced coffee. My morning cup of coffee would greatly benefit from this sweetner. Thank you! 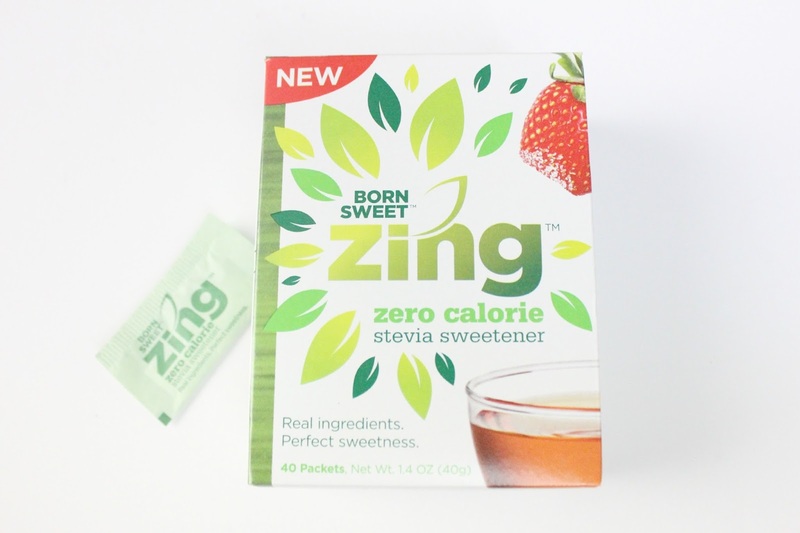 I'm most excited to mix Zing Zero Calorie Stevia Sweetener with my iced tea first. Thanks for the giveaway! I am excited to try this in iced tea and coffee. I would try it in my cranberry juice. Yummy recipe! I would like to try some Zing in my iced tea. Being from the South, this will go in my iced tea. I'd add it to my morning strawberry banana protein smoothie! I would love to try this in our morning coffee. I'd add to my morning coffee and those occasional late afternoon iced coffees. I'd love to add this to my coffee! I'm interested in trying it in my coffee! My coffee could use this sweetener in the morning. I'm most excited to give it a try in my homemade hot cocoa recipe. I'm excited to try it in my morning coffee. i would like to sweeten my iced tea with it! I'd like to sweeten my green tea - I love it, but it's a little bland without sweetener! I'd like to make my frappuccinos with Zing. I would love to try this in my iced coffee yum! I'd put it in my homemade cocoa. I love peppermint green tea by itself, but sweetening it just a bit takes it to the next level! I'd love to add this sweetener to it next time! hmmm I think I would try it in my homemade lemonade first. We drink SO much of that in the spring/summer. I would love to add it to mint and limeade!